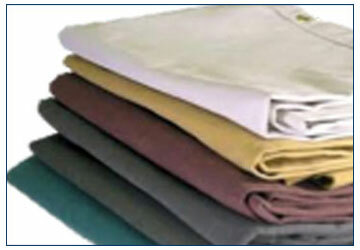 We are one of the leading manufacturers of 'Anchor' Cotton Canvas Tarpaulins. Cotton Canvas Tarpaulins are the toughest tarpaulins in the industry. The natural properties of cotton make them the safest and sturdiest of all Tarpaulins. ANCHOR™ Brand 100% Waterproof Cotton Canvas Tarpaulins are fabricated from mill made cloth duly stitched. Eyelets are fit at every 1 MT with extra reinforcement at all four corners. Wax / Chemical is used as a proofing agent to make it 100% Waterproof. Cotton Canvas Tarpaulins are the toughest tarpaulins in the industry. The natural properties of cotton make them the safest and sturdiest of all Tarpaulins..
• 100% Cotton Single/double duck fabric. • Dyes as per colour requirement. • Waterproofing agent – Wax or Chemical. • High quality cotton threads. • Super Strong brass and metal eyelets. •	Toughest and Best-in-class Cotton Canvas Tarpaulins. •	Wax and Chemical Coated to make it 100% Waterproof. 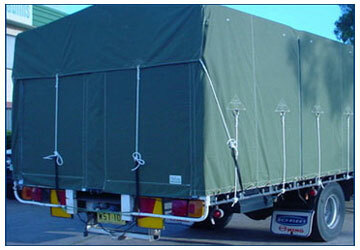 • Heavy-duty canvas tarpaulins built with strong thread shaft. •	Sizes can be made, cut as well as finished as per buyersâ€™ requirements. 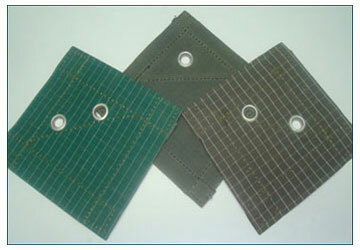 •	Widely used in the transportation industry suitable for truck covers. •	Used extensively to cover heavy machinery in the manufacturing industry. We manufacture ANCHOR™ Cotton Canvas Tarpaulins from 6' x 6' to 100' x 100' with varieties of combinations in fabric, process, colours, sizes etc..